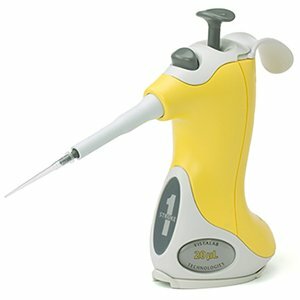 Do other manufacturer’s tips fit the Ovation pipette? 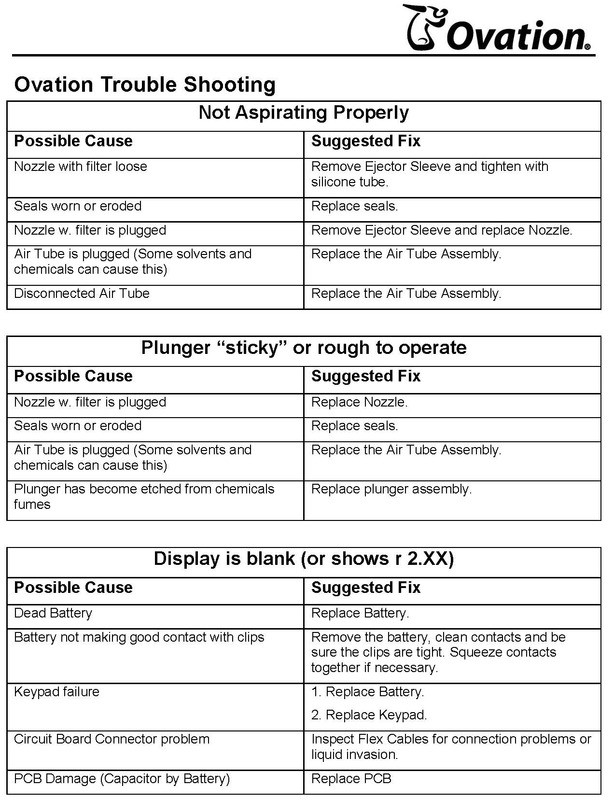 Some other manufacturer’s tips do fit Ovation pipettes, however we can not assure that our stated performance specifications can be met when other tips are used. All performance claims in our literature and on this web site are based on using the Ovation pipette with Ovation tips as a system. Additionally, the tip acquisition and tip ejection functions may not perform properly when other tips are used. See the Ovation Tip section of this web site for more information on this topic. How often should I verify calibration? What volume should I use when verifying calibration or changing calibration for a specific liquid? For accurate pipetting performance across the entire range, calibration verification should be performed at the pipettes’ maximum volume. For optimum performance with a specific liquid at a specifically used volume, use the desired volume setting. If the specific liquid is dispensed at multiple volumes, then use the pipette’s maximum volume. 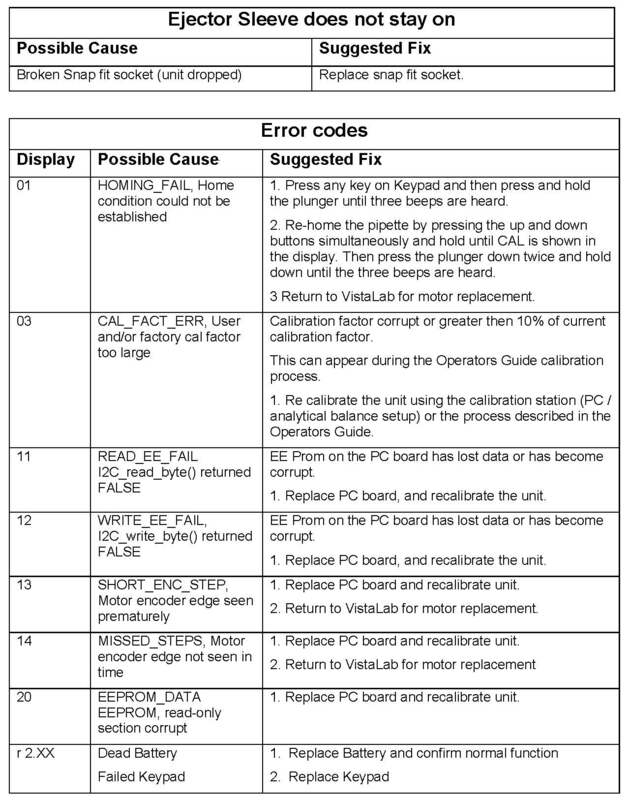 Is calibration covered under warranty? No. 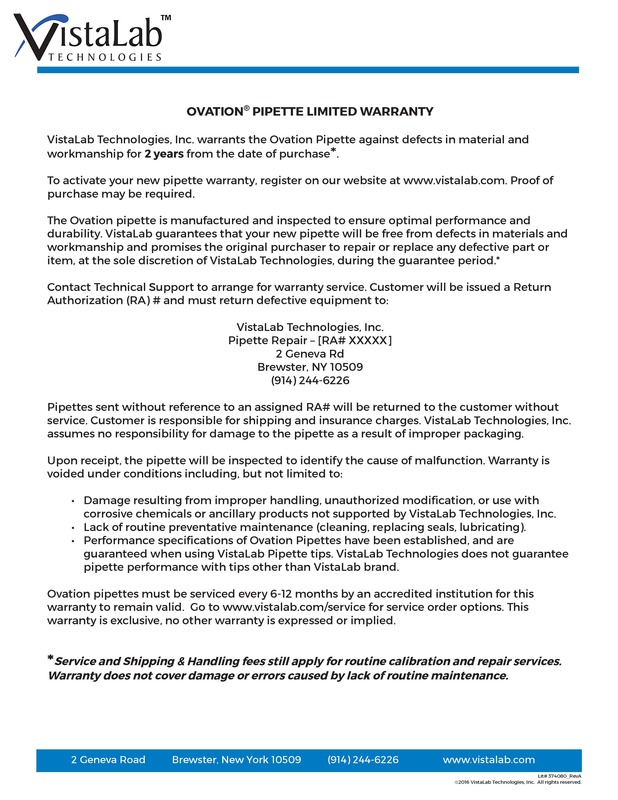 Each Ovation pipette is sent to you with a calibration certificate that is generated at the time of manufacturing. This assures you that when the pipette leaves our factory, it is calibrated by trained technicians to the performance specifications using the reference (gravimetric) method. Reference documents (ISO 8655) recommends that prior to use, pipette tips should be pre-wet with the sample to be used. This greatly increases the accuracy and precision of your work. No. Pipettes are calibrated to deliver (TD) or to contain (TC). Rinsing out will change the amount of calibrated liquid being dispensed. How can I decontaminate the pipette? All Ovations can be decontaminated by wiping down the outside surface with a 70% solution of ethanol or isopropanol, or use a 10% bleach solution followed by water. What is the purpose of the liquid blocking nozzle? The liquid blocking nozzle contains an internal aerosol/liquid barrier filter to prevent liquid from being aspirated into the pipette. It also offers some protection to internal parts from routine exposure to hazardous liquids and vapors. If this filter becomes wet, the pipette will not aspirate fluid until a new nozzle is installed. How do I know it is time to replace seals? Can the Ovation Pipette be autoclaved? Only the M (mechanical) Ovation can be autoclaved. Refer to the Quick Reference Guide or on-line Operator’s Guide for complete instructions. In addition, the outer surfaces can be decontaminated by wiping down the outside surface (except for the LCD screen) with a 70% aqueous solution of ethanol or isopropanol, or use a 10% bleach solution followed by water. ONLY WIPE THE LCD SCREEN WITH WATER.